If you’re going to make every single gun from gaming’s past, present and future out of Lego then there’s one you absolutely can not miss: The BFG 9000. Want to know if the new Doom stacks up against the original? Here’s our Big FAQ Doom guide to let you in. YouTuber “ZaziNombies” (we see what you did there, and we are in two minds about it) has a channel devoted to Lego recreations of the finest in digital hardware. While life-sized versions of Minecraft’s TNT or Team Fortress 2’s Force-a-Nature shotgun are all well and good, if you’re doing guns then Doom is the daddy. The “Big Fricking Gun” (come on, now, we all know what BFG really stands for, right Roald Dahl?) 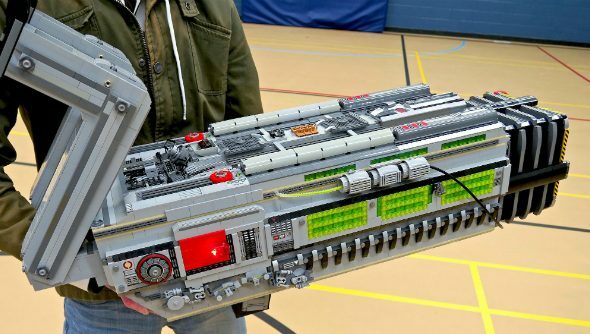 comes in at more than 5,000 separate Lego bricks, and weighs 20 pounds. Of course, the real demon-alien decimator would probably weigh a shade more than that, but considering it’s made of hollow plastic bricks, that’s impressive. The attention to detail is nice, even though Mr. Nombies is working from a 1993 sprite, and some of the construction methods are pretty smart, like using 1×6 smooth tiles sideways in between the brick pegs to make vents.